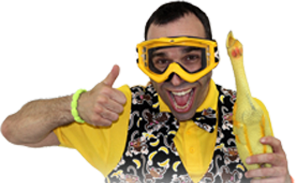 Although I don't like to be serious for more than 3.5 seconds, there are a few things I'd like you to be aware of if you are thinking of having a Mr Banana Head party. 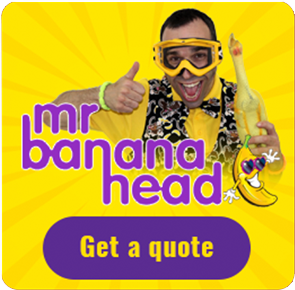 Having sat down with the Mr Banana Head lawyers, Haddock, Melon Head and Fingers, I just wanted to explain about the booking fee you pay for the party. If, once you have paid the booking fee you decide to cancel the party for any reason, the booking fee is non-refundable. If you decide you want to reschedule for a later date, you can do so. If the new date is on a weekend, you can carry over half the booking fee you have paid, the other half will be lost. If the new date is on a weekday (not including Bank Holidays), you can carry over the whole booking fee you have paid. If you are cancelling due to the weather (ridiculous amounts of snow for example), then the whole booking fee can be transferred over regardless of when the rescheduled date is (weekend or weekday). Please note the new date must be within three months of the original party date. More extremely serious points coming in 1986 when I get my DeLorean time machine back from Doc Brown.